Sincere wishes for a Happy, Safe, and Blessed New Year! 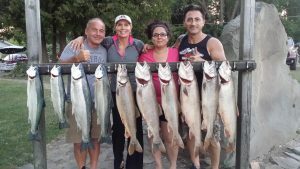 Thank you to all my guests who fished with me last season. 2018 guest photos are now on the website. The best time to book a trip for 2019 is before the end of February. Nearly half of 2019 is full now. The fishing outlook for 2019 is excellent. 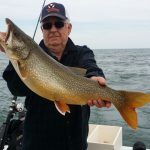 Lake Michigan should continue to experience steady Salmon fishing, and Lake Huron will most likely have similar Lake Trout and Walleye fishing for 2019. 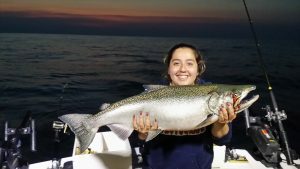 The big news for Lake Huron is aggressive stocking of Atlantic Salmon. 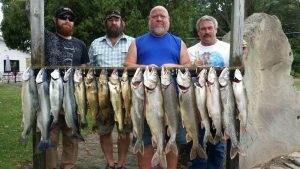 This is a fishery that has been steadily improving. 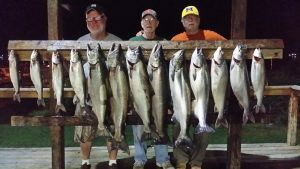 After 2 weeks of fishing that was on and off, the usual August variety has arrived. 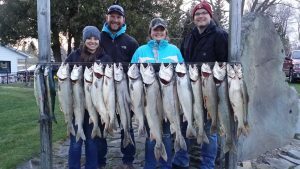 Giant Lake Trout, Steelhead, and Walleye are all being caught in 100-150 ft. of water, mainly due north of Grindstone. 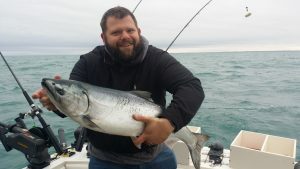 The Steelhead and Walleye are hitting any flashy spoons on 3-10 color leadcore rigs, and the Trout are near the bottom. 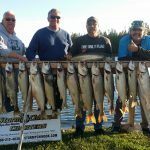 I have had several fish over 20lbs in the last week. If you are interested in a charter, I have openings after August 29. 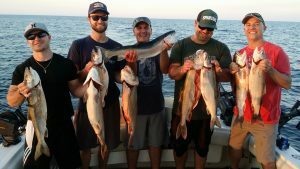 September is traditionally great fishing, but the weather can be a problem with more frequent fronts. 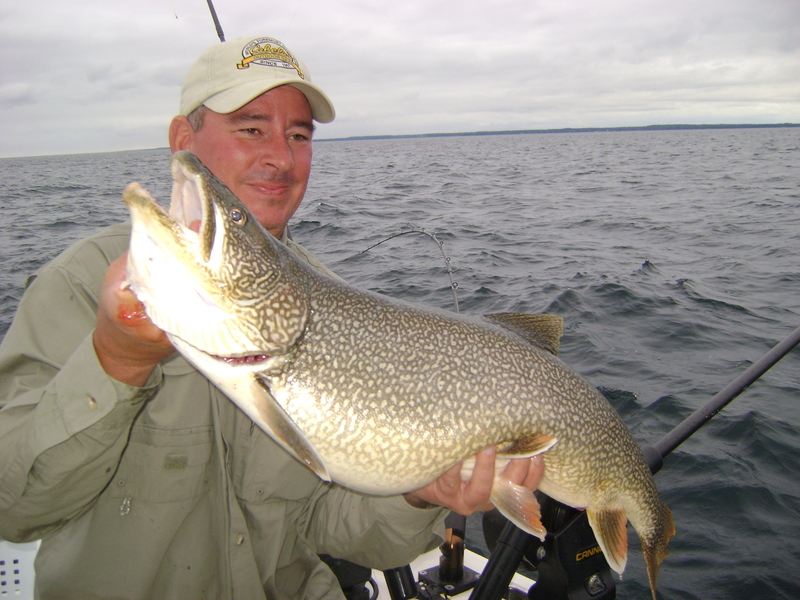 The photo below is a 27.5lb Lake Trout, and the other photo shows some of variety this time of year. 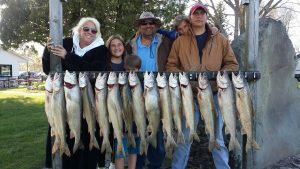 The cold water and persistent Northeast winds we had all spring has resulted in only fair Walleye fishing. The best action is well west of Port Austin in 20-40 feet of water. 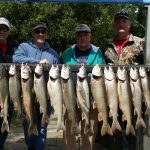 Lake Trout has been good, with some exceptionally large fish this year. Nearly every direction out of Grindstone is holding fish, in 110-150′ of water. Many of these fish are suspended, but the biggest ones are on bottom. we are also seeing a lot more Steelhead this year. 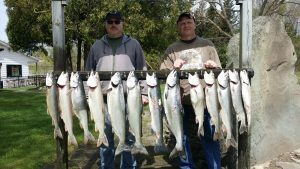 I have had as many as 10 Steelhead on per trip, but they are hard to get in the boat. These fish are in the top 30 feet. Good luck fishing. 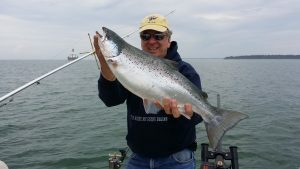 I am full until September, but September is a great time to fish, as long as the winds stay down. 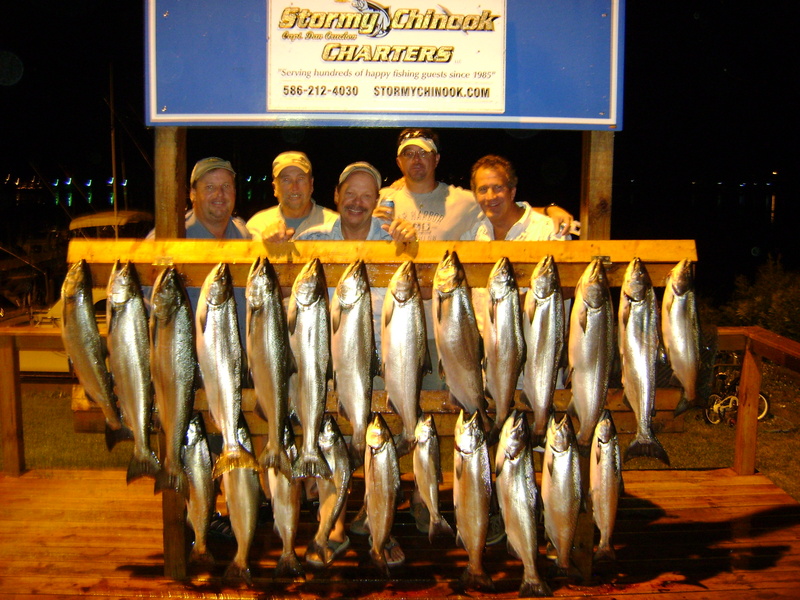 If you are interested in a charter, I will be happy to recommend someone. Captain Dan. 586-212-4030. 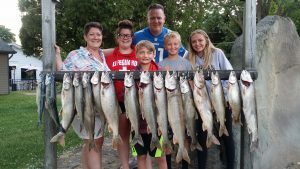 Grindstone/Port Austin area continues to have great fishing, but it isn’t as easy as last year. There is some work involved to get a nice catch. 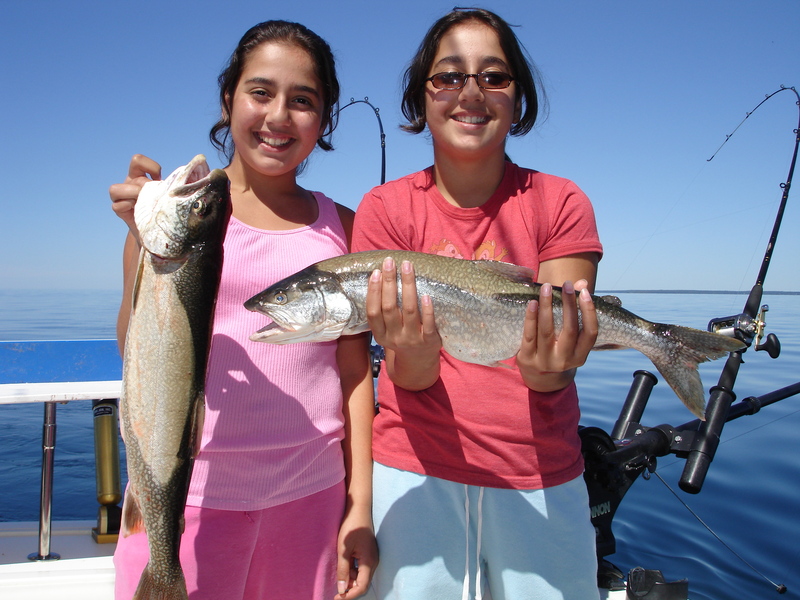 Lake Trout have been suspended at times, so it’s worth running 2-5 colors of lead core with magnum spoons. 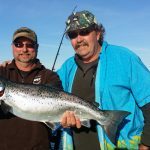 Some Steelhead and Cohos have been hitting those high lines as well, but the Chinooks have mostly disappeared as they always do in June. 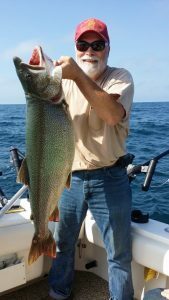 Big Lake Trout have been hitting spoons near the bottom in 120-140 feet of water, anywhere from 330-15 degrees out of Grindstone. 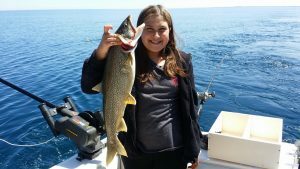 As of now, the water is still very cold and clear, and the Walleye are not showing up because of it. 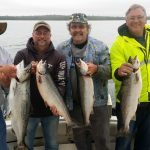 I spent 3 weeks at Drummond Island, and the fishing there was outstanding. 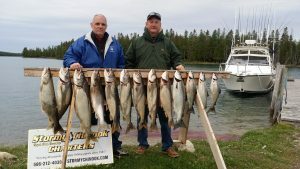 Plenty of nice Atlantic Salmon, and Lake Trout were available. 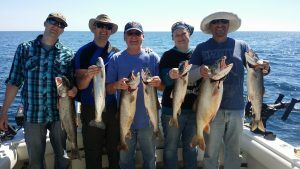 The best fishing was in the top 50 feet, anywhere around the mouth of the St. Mary’s River, and up to 6 miles offshore. 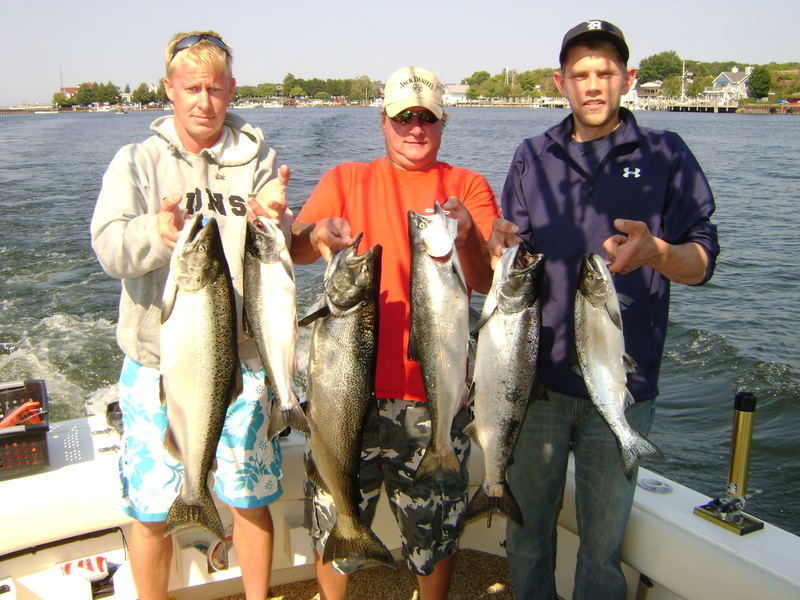 The season has started successfully at the tip of Michigan’s thumb. The only problem has been the cold, windy, rainy weather. 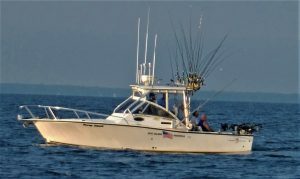 The area I have been fishing is due north out of Grindstone in 80-110′, just southeast of what we call the “tip of the reef”. 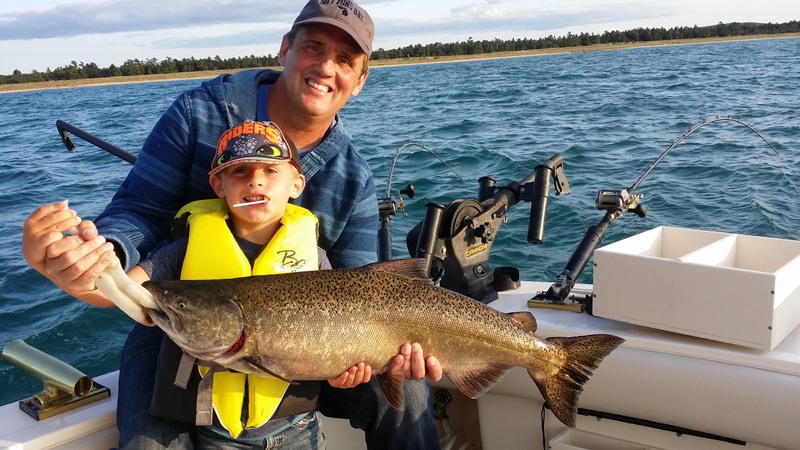 Limit catches of Lake Trout, mostly 5-9 lbs, but some bigger ones have been showing up. 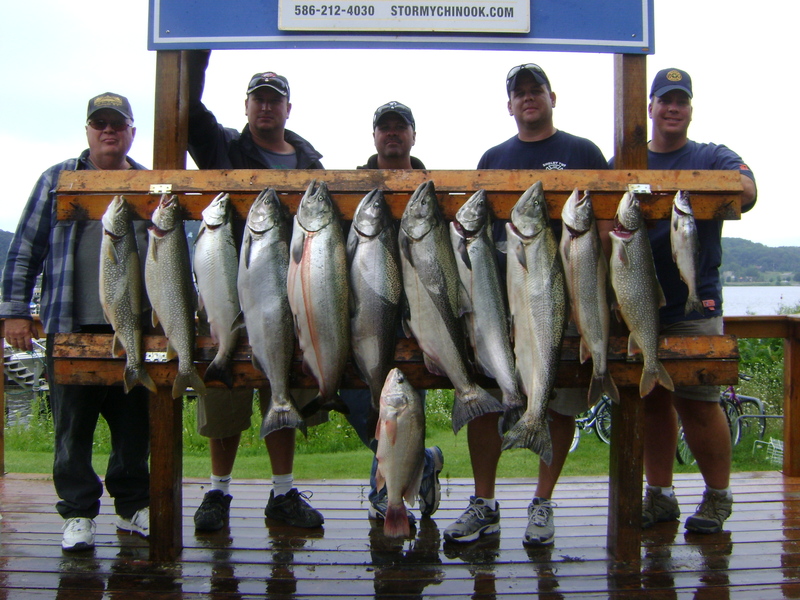 The big surprise is the Chinooks, mostly around 12lbs. I have caught Salmon on every trip, but have had as many as 9 on in one trip. They are hitting spoons in the top 35′ of water, and the warmest water I could find is 46 degrees, but that will change quickly. Above are a few photos taken since 5-13-18. I still have a few weekday openings in June and July. I HAVE FISHED WITH CAPT. DAN FOR 27YRS. : IN MOST ALL THE GREAT LAKES. CAPT. DAN KNOWS WHAT HE IS DOING. 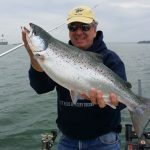 I HAVE FISHED WITH DAN MANY TIMES WHEN WE HAD FISH IN THE COOLER AND OTHER CHARTER BOAT CAPT.S (WHOM HAD NO FISH) WERE CALLING HIM FOR POINTERS. DAN GOES OUT OF WAY TO MAKE SURE YOU HAVE A THE BEST TIME!!! 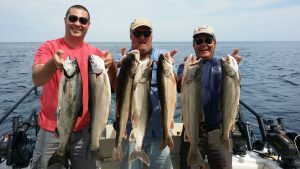 I have fished with a lot of charters but this trip surpassed them all. A good guy that knows how to fish. If your looking for a good captain that's very friendly and accommodating then this is the charter for you.